The summer has been a busy time for making and planning projects, as well as the usual summer activities, so the blogposts have been neglected. 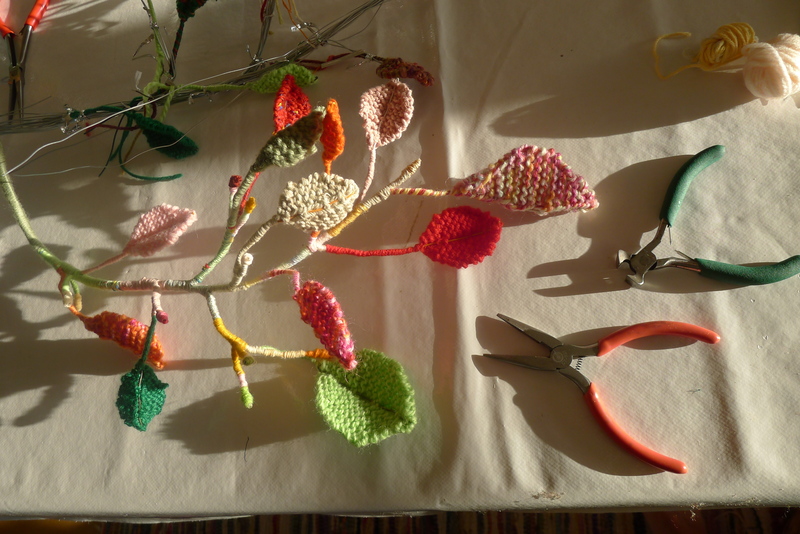 Since returning from Gdansk late November I have continued working on knitted leaves and branches. 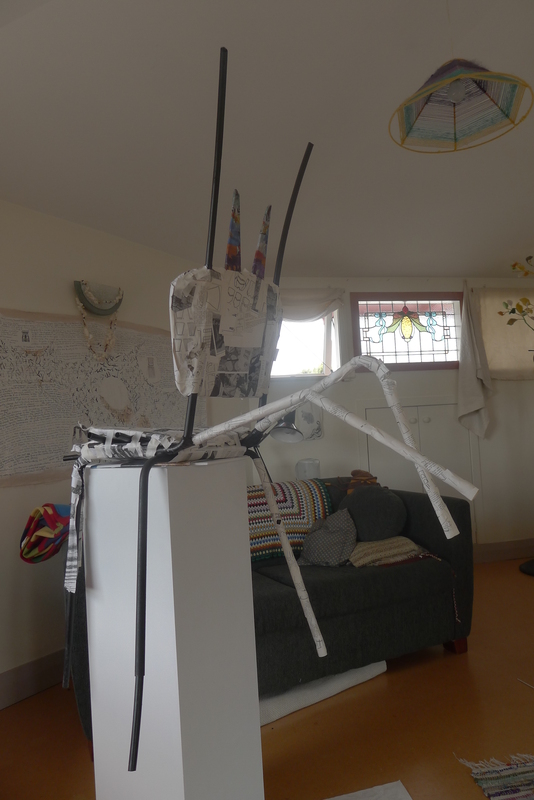 A very different project was the re-presentation of a plain old plywood and steel pipe school chair for The Chair Project (part of Artists Open Studios Whanganui 2014). 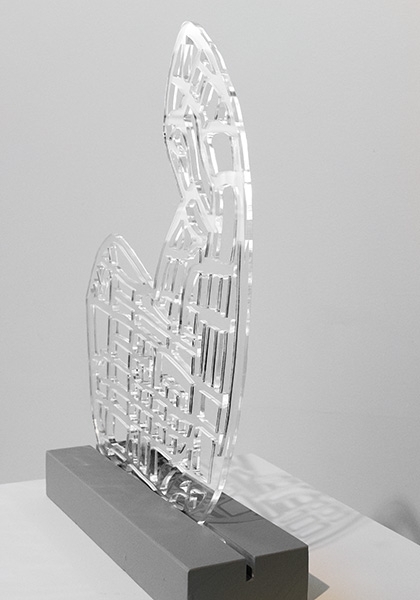 This event will be held on two weekends – 22-23 March and 29-30 March, and feature 100 artists from all over the country, displaying and selling art in 66 open studios. 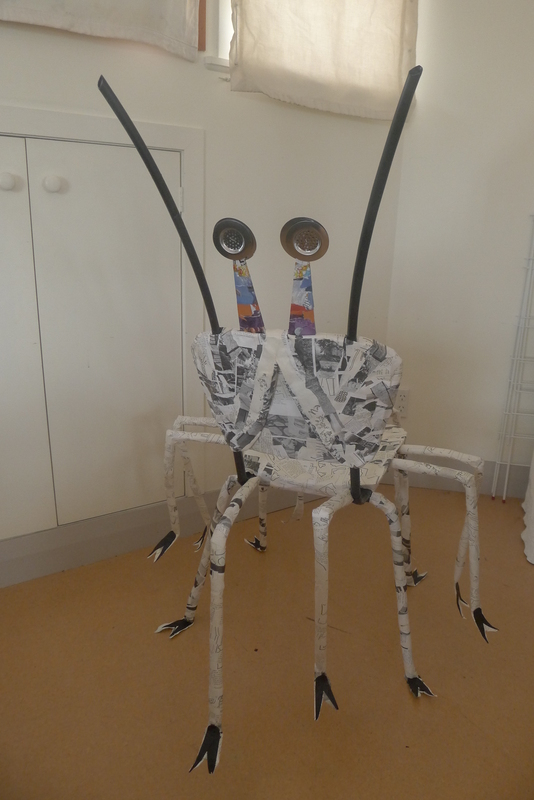 This paper mache enhancement evolved into a crabby chair! Returning to the knitting I assembled a new branch. 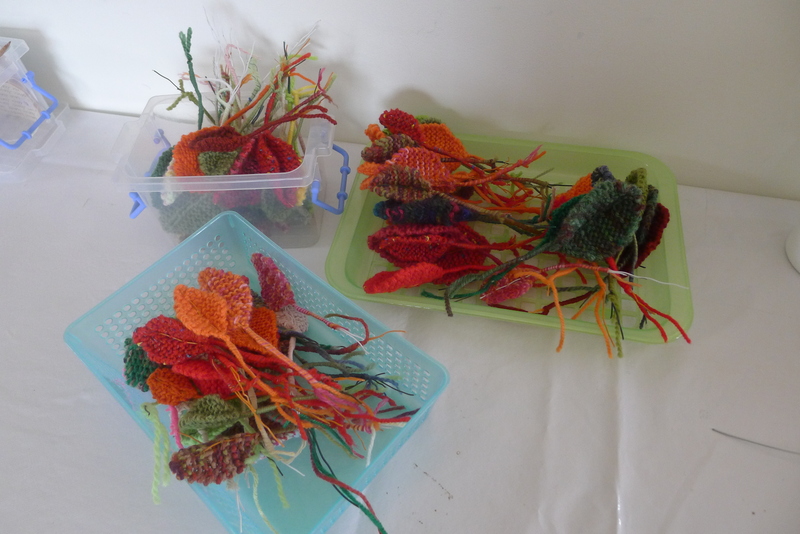 This was to be part of a group of knitted branches to be installed on stakes, like young saplings, at Harbourview Sculpture Trail in March. 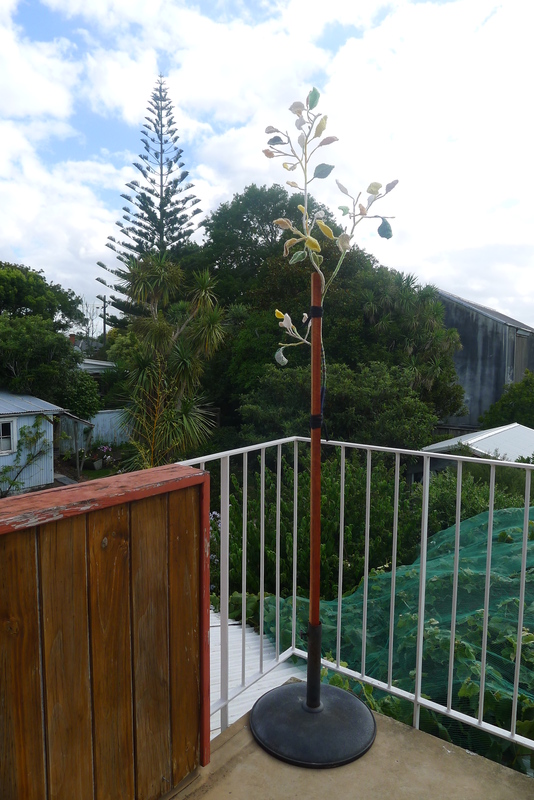 The group would form a small orchard, harking back to the heritage of European settlers in West Auckland who established orchards, market gardens and vinyards to provide for Auckland’s growing population. Once completed the branches were tried out with various means of support including a concrete umbrella base which I decided would work well and – without its adjustable screw – lose that strong association (although given the way the early settlers chopped native trees down, the fruit trees they planted were the only form of shade, apart from sun umbrellas which they often had by their houses – symbols of a new lifestyle). 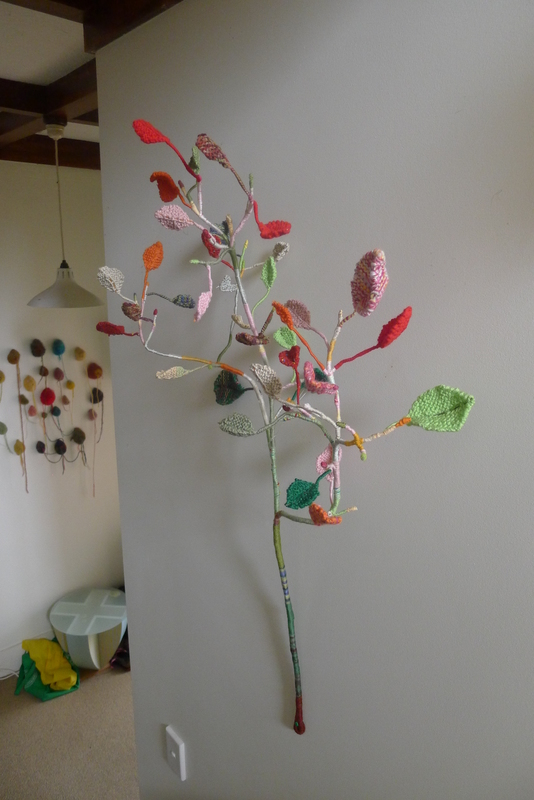 As the branches are made of yarn and non-stainless steel they need to be inside in the long term, although they are robust enough to stand several weeks outside quite happily, so I also wanted to show how easily they can be displayed indoors. 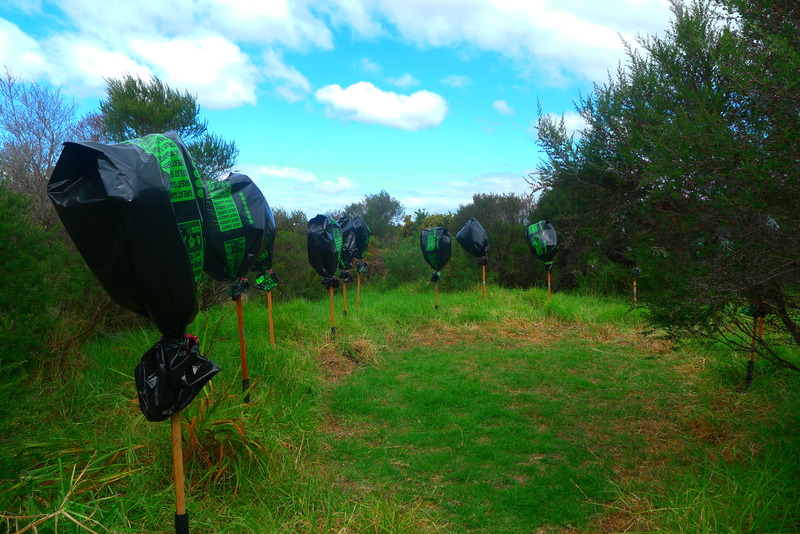 With the “saplings” installed now at Harbourview Sculpture Trail on Te Atatu Peninsula, they await the opening – protected meanwhile from sun and rain.